You are cordially envited to the next Meteek & Co event, “Local Producers” on Thursday February 21, 2013, 5:00 – 8:00 pm! What do bikes, fish, plants, bees, chickens, teaching and food have in common? 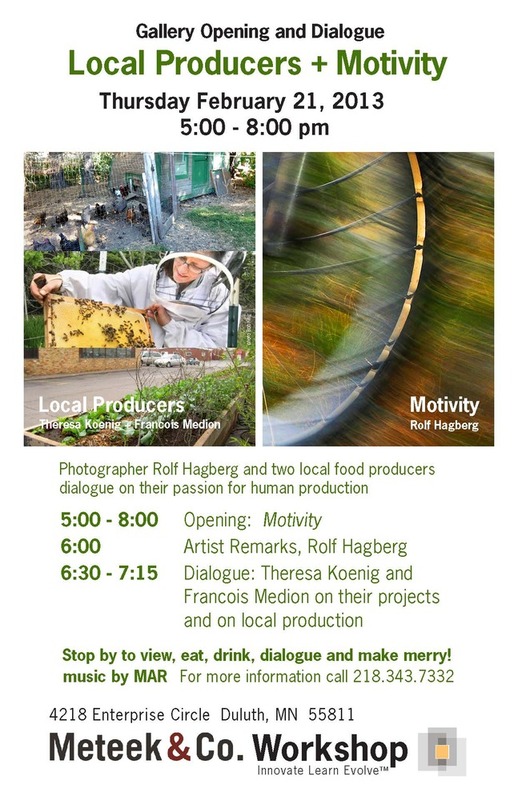 “Local Producers” will address those questions and more, featuring local food producers Theresa Koenig of 5th Avenue Farms and Francois Medion of the Duluth Grill farm, and photographer Rolf Hagberg’s series “Motivity” on motion, energy and bike riding. Doors open at 5:00. Rolf will be giving some remarks and answering questions about his images at 6:00 pm, and Theresa and Francois will discuss current projects and lead a dialogue on local production at 6:30. Local DJ MAR will provide a sonic landscape. Come by to view, eat, drink, dialoge listen and make merry!